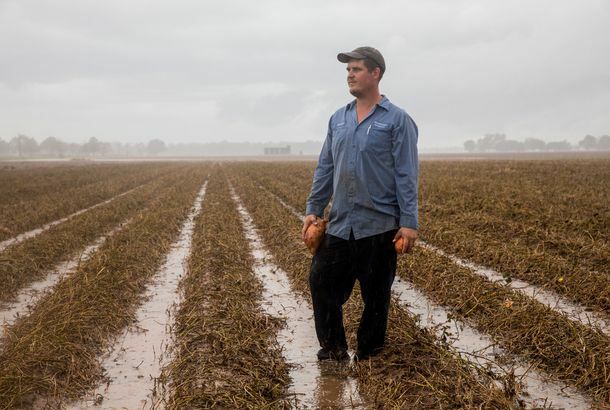 The Farmer Struggling to Recover After Hurricane Harvey Destroyed EverythingHurricane Harvey wiped out Garrett Gundermann’s Texas farm. This is what it’s like to start over from scratch after unprecedented devastation. U.K. Farmers Warn Brexit Could Make Their Crops ‘Rot in the Fields’In a very familiar-sounding argument, they point out 20 percent of their workforce is foreign. Quit Your Day Job and Start Growing ShiitakesDemand is higher than supply. 6 Things to Know About the World Food Prize’s PoliticsMonsanto and the Gates Foundation are big donors. Hey, There Are Carats in That Garden!A Swedish baker finds her missing wedding ring in an unlikely spot. Pennsylvania and New Jersey Wines Get Some Recognition; An Incurable VirusPlus more money than ever will be spent on concessions at the Super Bowl, and Michelle Obama works with Wal-Mart to reduce the price on fruit and vegetables, all in our morning news roundup. Study: Even With Soda Tax Kids Will Be Fat; Germany Pledges Millions to BattlePlus windowsill gardening could be a boon to fresh food-deprived urban areas, and Angelina Jolie digs Spanish food, all in our morning news roundup. Zitner Candy Corp. Gears Up For Easter; Public-School Cafeteria Workers UnionPlus the Times asks readers for spaghetti taco-like food mash-ups, and a UK chef finds a perfectly round egg, all in our morning news roundup. Farm-to-Plate Hits The HighwayNewly proposed license plates honor California’s agriculture. Ag School for Scientists; Boosting the Dairy Industry with Raw MilkPlus: a chocolatier that’s defying the recession, and Jamie Oliver’s dating site, all in our morning news roundup. America’s Hottest Young Farmers, Readers’ Choice EditionMother Nature Network asks its readers to nominate forty young farmers. Hot Young Farmers Cultivate Vegetables, FollowingsThe next wave of farmers is savvy, urbane, and progressive. One Market Gets a New ViewThe new 42nd-floor event space lets you see the whole Bay. Meet a CSA GeniusMacArthur Genius Award winner Cheryl Rogowski discusses sustainable farming on March 8.